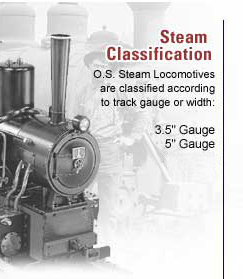 Live steam locomotives are classified into several types according to track gauge, namely, the track width. 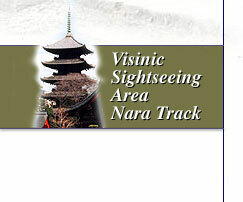 Common types in Japan are currently the number one gauge (45 mm), the 3-1/2" gauge (89 mm), and the 5" gauge (127 mm). The number one gauge is mainly for enjoying free runs, where one cannot ride and operate the locomotive. Methanol is the commonly used fuel. The 3-1/2" gauge allows one to ride and operate the locomotive (locomotives carrying more than 10 passengers are not unusual). Furthermore, even though the locomotives in this class are scaled down from the real thing, they have a relatively easy to handle size and can be easily transported and stored, making them ideal for enjoyment with family and friends. The 3-1/2" gauge also has many enthusiasts throughout the world and is expected to gain even more popularity. The 5" gauge conceals even more power than the 3-1/2" gauge. These locomotives are larger and their weight approaches 100 kg. Some locomotives have a tractive force capable of carrying 20 or more people! This class is popular among enthusiasts wanting to carry and move many people. There is also a larger 7-1/5" gauge and a 4-3/4" gauge that is commonly used in the US. Although there are many classes of live steam locomotives such as these, layouts centering on the 3-1/2" and 5" gauges are appearing in various places. Some layouts have a track length of 300 meters or more and they are expected to continue to increase. Why not join this richly rewarding hobby of live steam locomotives?